It's no secret that late Apple CEO Steve Jobs was keen on bringing the company's technology to the automotive world. In fact, according to longtime Apple board member Mickey Drexler, "Steve's dream before he died was to design an iCar." Apple's senior vice president of worldwide marketing, Phil Shiller, echoed those sentiments during the company's copyright infringement trial against Samsung, saying there had been discussion of Apple making a vehicle. Immediately following Jobs' death, it seemed like his dream might never come true. But since then, Apple has made a big push to integrate its Siri technology into vehicles. Meanwhile, automakers are finding ways to get iOS apps to work on the dashboard. These and other moves have set Apple on a collision course with Microsoft and Google in a market that's still very much up for grabs. Steve Jobs may have harbored dreams of roads filled with purely Apple iCars, but the post-Jobs Apple world has a different idea: integrating with the cars already out there. Laptop Mag's Daniel P. Howley explains how Apple's looking to get iOS out of your phone and into your dash. Although voice recognition has been available in cars for several years through technologies like Ford's SYNC (powered by Microsoft), Apple's Siri is making serious inroads with multiple automakers. Chevrolet already offers Siri integration in its Spark EV, as does the 2014 Cadillac CTS. Other manufacturers - including Audi, BMW, Chrysler, Ferrari, Jaguar, Land Rover, Mercedes and Toyota - are expected to bring Siri into their cars in the near future. Siri Eyes Free mode is a specialized version of Apple's voice-controlled digital assistant that interfaces with a vehicle's own voice-control feature. Users sync their Siri-equipped iPhone with their car's infotainment system via Bluetooth or USB, and activate the feature by pressing their vehicle's voice-control button, usually mounted to the car's steering wheel. Siri Eyes Free lets you do everything from make calls and play music to hear and compose text messages while you're behind the wheel. Apple isn't content with making Siri integration its sole automotive strategy. Take one look at the company's careers page, and you'll see job openings for iOS Car Services. Michael Gartenberg, a research director at market-intelligence firm Gartner Analytics, said Apple is fully capable of further penetrating the automotive market beyond its current offerings. 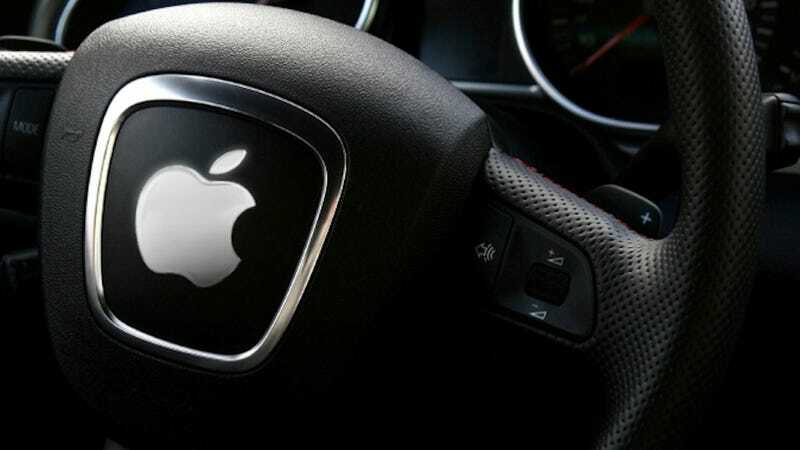 "It wouldn't surprise me if we saw Apple further evangelize automobile vendors to incorporate more types of technology that could be tied back to applications, including things like navigation and other types of connected entertainment," Gartenberg said. Gartenberg believes Apple could use its AirPlay technology to remotely present iPhone or iPad applications on a vehicle's infotainment display. "We've already seen music; we're now seeing Siri. It doesn't take a lot of imagination to see what the next one could be, and then how Apple could go ahead and implement those things," Gartenberg said. Assuming Apple got automakers to play ball getting AirPlay to work in a vehicle wouldn't take much effort on the user's part. Today, users can easily stream everything from video and photos to music and games to an Apple TV with a tap of the screen. However, the Connected Car Consortium (CCC), an industry group composed of vehicle manufacturers and electronics makers, has its own ideas on how to connect apps to cars. The CCC, which includes most handset makers but not Apple, is working to offer automakers its AirPlay-like MirrorLink standard. MirrorLink streams a smartphone's display and repurposes it for use on a car's touch screen. A wireless version of MirrorLink, called MirrorCast, will be made available to automakers. CCC representatives said the reason for Apple's absence in the industry group is likely tied to the requirement that member companies abide by a series of standards to receive CCC certification - something Apple is not likely to agree to. In addition to the CCC, some other tech heavyweights have a stake in the automotive field - which could complicate things for Apple. Google has been working on its own self-driving car for years, and its Android operating system is already being put to use inside infotainment systems from Kia, Saab and Renault. Automakers like Audi and Mercedes also have integrated Google's Maps, Earth and Street View apps into their respective navigation systems. Microsoft has had a strong foothold in the automotive space since 2007, when it began powering Ford's Sync system. That system is now available on most Ford vehicles. In addition to Ford, Microsoft has partnered with Kia Motors to develop Kia's UVO infotainment system. However, that system is being replaced by an Android-based version of UVO on the 2014 Kia Soul. Anna Buettner, IHS senior analyst, said Apple's reluctance to take orders from others could limit its impact on the automotive market. "If Apple ever comes out with an automotive-grade OS, they would have to comply with [original equipment manufacturer (OEM)] rules in some way…and Apple, in general, has problems with following rules." A more practical issue that could hinder Apple's growth in the automotive space is the speed at which the company innovates. The auto industry is notorious for its slow pace. In general, it takes 3 to 5 years for a vehicle to come to market. This issue, Buettner said, has been a thorn in the side of automakers. "Apple isn't making the OEMs' lives easier," she said. "It is very frustrating for them to accommodate Apple, but OEMs don't have a choice, due to the popularity of the iPhone, iPad and so on. Buettner mentioned Apple's move to the new Lightning connector as one example of a high-tech monkey wrench. Creative Strategies' Bajarin believes Apple could accommodate automakers by informing them of the kinds of technologies its next-generation devices will use. "Apple's tactic, or really any player's tactic, would have to be to get the car industry to embrace some kind of standard that you are going to use," he said. Though Apple is making inroads into vehicles via its software and hardware offerings, it is unlikely the company is actually working on a vehicle of its own, Bajarin said. A more likely strategy for Apple is to turn as many vehicles as possible into iCars through a combination of software and hardware integration. If more automakers use an Apple operating system - rather than competitors' - in their vehicles, iPhone users will have an even greater reason to stay invested in the brand. "Tactically, it's a good idea, because it helps drive more platform loyalty to [Apple's] hardware and software," Bajarin said. Similarly, if an automaker offers an Apple-powered system, it could use the software as a marketing tool to pull in Apple fans. Chevy is already doing this with its new Spark with Siri Eyes Free mode integration. For now, it appears Apple is using Siri Eyes Free mode to test the waters. If the company receives a positive response, it will likely begin working on a more ambitious infotainment solution of its own. Despite the fierce competition in this space, Bajarin believes that Apple is in the pole position because of the way it operates. "Apple has a lot going for it, in that it controls so much of the ecosystem from hardware, software to services. It is probably in the best spot to bring some sort of a standard to the automotive industry."